Process Builder is one of the most powerful tools provided by Salesforce to implement business requirements declaratively. Till date, we have created many processes to fulfill business requirements. I have created 100+ processes just for my blog posts! Process Builder helps businesses to save time, as well as money, by implementing solutions quickly. Implementation of Process Builder is straightforward – you create a Process; tests it; and then, use Change Set to deploy it to Production. The best part is, you do not have to write test classes for your Processes or Flows. But there are few limitations of Process Builder vis-a-vis Workflow! Yup! You read that right! Workflow has an upper hand when defining Rule Criteria! Let me unravel this mystery by offering an example: As a System Administrator, you receive a requirement to auto-create a Quote record whenever Opportunity Stage is Proposal/Price Quote or Negotiation/Review. If you created processes using Process Builder before then, you know how I set two values for Stage picklist. But, for those, who are relatively new to Process Builder, let me walk you through the process step-by-step. Workflow Rule allows you to select multiple values for a picklist. If you look at the Workflow Rule screenshot, I have chosen (defined) both the picklist value in a single line using commas (,). But if you try to achieve the same thing using the Process Builder, it will not work. Unlike Workflow rules, one cannot develop a rule criteria to select multiple picklist values, in a single stroke, using Process Builder! 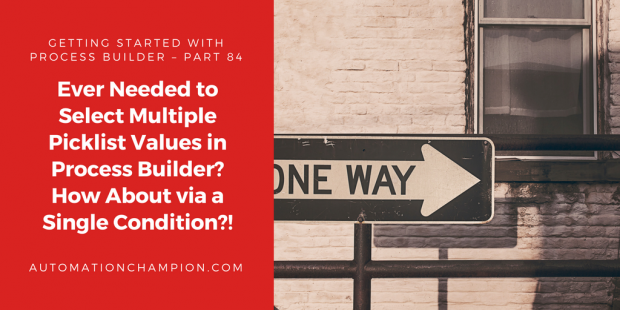 For the detailed explanation, please refer to the following article published by Salesforce – CONTAINS with multiple comma separated values does not trigger a Process Builder or a Flow. 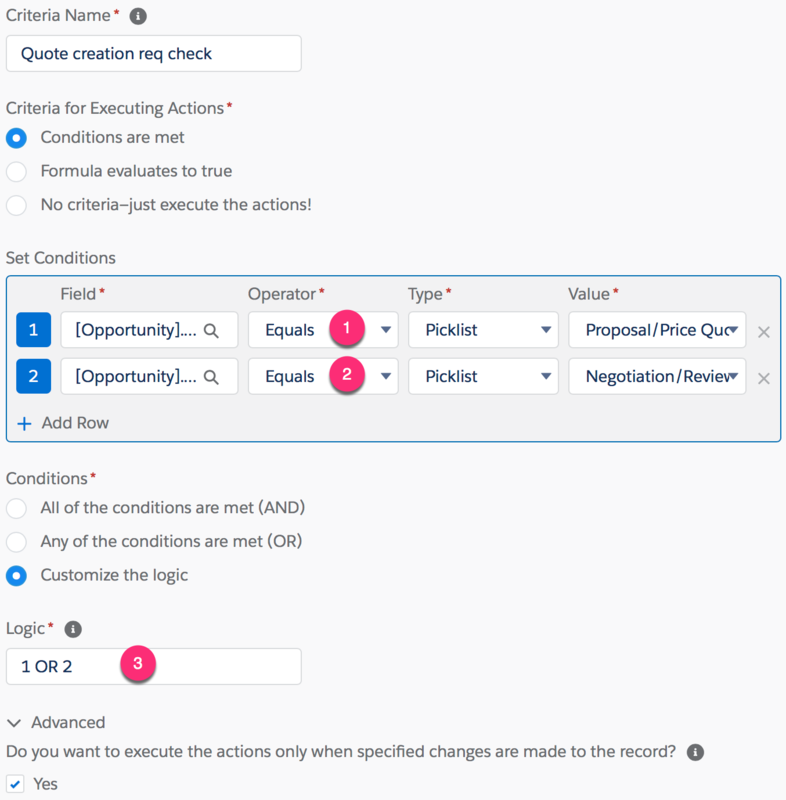 The solution suggested by Salesforce (is the same as I have used in Process Builder screenshot) is good for the simple business use case. But what about a complicated requirement where you need to take other things into consideration (like Amount > $1000 and Close Date > Today) while defining process criteria? Ugh!! what a nightmare – Prone to errors and a whopping headache! For, in the aforementioned scenarios, you will be using multiple AND/OR statement, as I did in the preceding screenshot – (1 AND 3 AND 4 ) OR (2 AND 3 AND 4 ). Thanks to highly talented users of automationchampion.com blog for their constructive feedbacks and, especially, for challenging me to come up with a streamlined solution for the aforementioned problem. Well, challenge accepted! In this article, I am going to share my tricks to solve the above business use case using a simple formula. Let us start with a business use case. There are a few possible solutions for the above business scenario, but we’ll use Process Builder to solve the above business requirement. Before trying to understand the technical aspect of the solution, let us spend some time to understand the Case formula in Salesforce and how to use it. 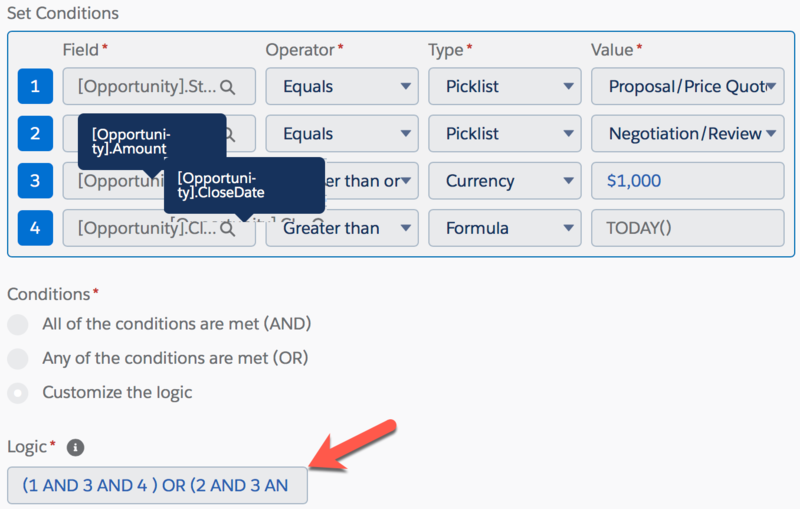 I hope you can learnt from the blog about how to select multiple picklist values using Process Builder!! Yes, go ahead! Show off your newly acquired skills to your friends, colleagues and families! Jokes apart, mastering these skills will enhance your productivity and propel you to try various permutations and combinations to incorporate automation in your day-to-day processes and procedures. Spring into Top Ten Gems of Salesforce Lightning Experience Spring19 Release!